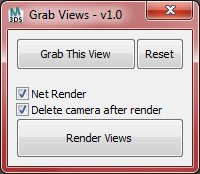 Simple macro buttons to set active view and run "Zoom Extents Selected" command. (If no object selected, "Zoom Extents" instead.) So you don't lose track of objects while switching views.